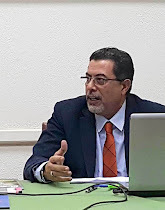 Over the past twenty five years or so I have led the development of a series of studies that involved expert and scholarly contributions while attracting global attention. 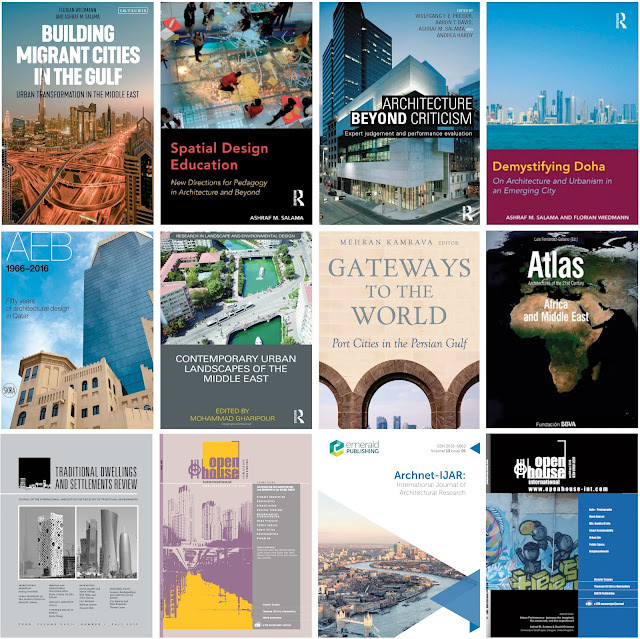 This includes books, journal articles, and critical essays, and the special issues of Open House International (OHI) on affordable housing, urban space diversity, evolving urbanism in the Arabian Peninsula, urban transformations in the Global South, advances in sustainable architecture and urbanism, and research perspectives on urban performance, This is coupled with my role as Chief Editor of Archnet-IJAR: International Journal of Architectural Research since 2007. My research and publication record in the field of architectural education and design pedagogy has been widely acknowledged and well recognized as evident in the recently awarded 2017 UIA Jean Tschumi Prize for excellence in Architectural Education and Criticism. My earlier work has focused on understanding various trends in architectural education as they relate to design studio teaching practices, developing an edited collection on cross-cultural perspectives relevant to architectural education at the beginning of the millennium, exploring horizons for the future of studio pedagogy, traditional, revolutionary, and virtual design studio teaching models, and collaborating with colleagues in establishing prospects for a better built environment through effective design pedagogy. 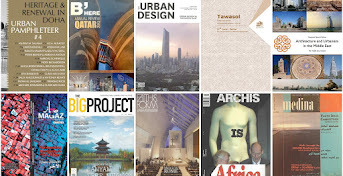 More recent efforts involves developing two special issues of Charrette: Journal of the UK Association of Architectural Educators: Shaping the Future of Architectural Education in Scotland (W/ A. Agapiou) and From the Global South: Pedagogical Encounters in Architecture. 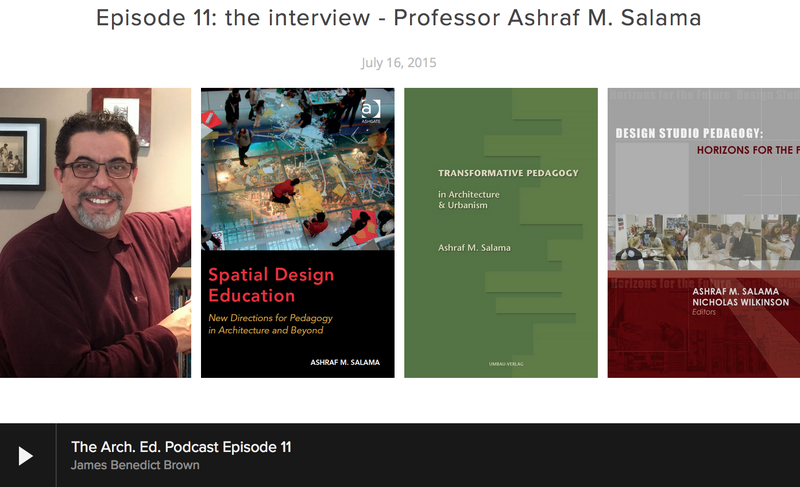 My studies into architectural design pedagogy have evolved into a theory for knowledge integration in architectural design education, incorporating transformative pedagogy in architecture and urbanism. My recent book Spatial Design Education: New Directions for Pedagogy in Architecture and Beyond encapsulates my efforts, since the early 1990s, in examining architectural design pedagogy as a paradigm whose evolutionary processes, underpinning theories, contents, methods, tools, are questioned and critically examined. My recent work aims at understanding and articulating the potential of research-led teaching in a responsive knowledge construction process. This includes integrating appreciative inquiry into architectural pedagogy and cultivating a culture of an inquiry-based and a process centred pedagogy. For more information see my pedagogy page, which includes my position and approach to classroom and studio teaching as well as various contributions and publications. An integral part of my research is the development of theory, which is based on various disciplinary perspectives. My work engages with social sciences, including human geography and environmental psychology. To this end, I have collaborated with colleagues and developed research frameworks that examined sustainable urbanism in the Gulf region (see: Knowledge economy and sustainable urbanism in emerging metropolises) and explored the reciprocal relationship between housing preferences and lifestyle patterns (see: Transdisciplinary knowledge for affordable housing). The implementation of these frameworks has resulted in a number of tracks that continue to generate research outputs which strive to enhance decision making toward effective place making and place management strategies. As part of our current research, we are examining our earlier framework on lifestyle theories, which is resulting in new insights that offer in-depth understandings of human-environment interactions. Outputs in this area are being developed and will be published in 2018 and 2019. Our research involves a socio-anthropological approach for exploring housing culture in contemporary Cairo, the evolution of housing typologies in Gulf cities, the role of mega projects in redefining housing development, and the impact of affordable housing on sustainability, and from a comparative perspective an examination of housing dynamics in various cities is imperative. Over the past 5 years I have collaborated with colleagues in developing approaches to explore urban dynamics as they relate to migrant communities. A perceptual approach for investigating urban space diversity has been developed and tested in the context of the city of Doha. Additionally, utilizing cognitive mapping techniques our research has examined the inhabitants’ spatial experience in the city. Among the important issues we have examined are responding to the questions of how urban liveability is perceived in the context of migration, and how housing conditions are perceived by migrant knowledge workers. Social restructuring and the relocation of migrant labourers is an important theme that our research has explored by developing in-depth insights into the understanding of the everyday urban environment of migrant labourers in Gulf cities. Recently, we have embarked on exploring opportunities for examining practices of migrant populations from the global south within contexts in the global north. Since 2012 our research team has developed a framework for investigating urban qualities in emerging knowledge economies, which was an important base for developing subsequent studies and research outputs such as our internationally recognized book Demystifying Doha: on Architecture and Urbanism in an Emerging City and our comprehensive study on knowledge economy and sustainable urbanism. Studies included uncovering the impact of economic transformations on urban structures, examining the production of urban qualities in emerging cities, exploring the notion of knowledge hubs, the resulting plurality and place typologies, and the way in which such notion impacts urban development, unveiling sustainable urban qualities in emerging cities, and developing understandings into the spatial development potentials of business districts. My research has earlier investigated the conundrum of identity and meaning in the context of Egyptian architecture with a closer look at the various trends emerged in the Nineties, attempting to offer a critical voice on contemporary Cairo. Critical and contextual approaches are an important part of my quest for understanding and interpreting visual voices from the Arab world. Building on the notion of global flows introduced by theorists such Castells and Appadurai my work in this area aims to develop a discourse on how cultural identity manifests itself in the public face of architecture. The examination of the image of a city, its associated meanings, and how this is reflected in the printed media is an important endeavour. 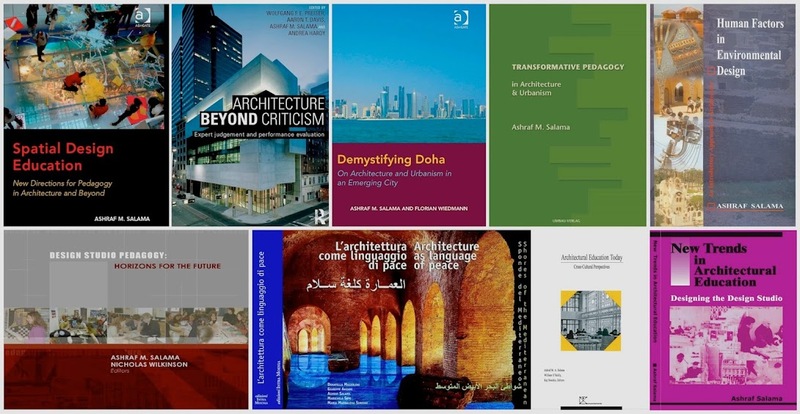 This is reflected in key publications that include manufacturing the image of Doha, interrogating the practice of image making, and our contribution to the pavilion of the Kingdom of Bahrain at the 14th International Architecture Exhibition La Biennale di Venezia (2014), entitled evolving Isms and multiple architectural identities in a growing region. Latest publications in this area involve an examination of evolutionary interventions in search of national architectural identity. While the examination of urban traditions may be perceived as overlapping with the area of socio-spatial practice of migrant communities, it is believed that the examination of traditions and the vernacular is a unique area in its own. Key works included explorations of socio-spatial aspects of traditional souqs (marketplaces) in the context of Muscat, Oman The study of contextual geo-cultural politics and their inferences on the shaping of architectural identity has resulted in advanced understandings urban traditions in the contemporary lived space of cities on the Arabian Peninsula. Issues relevant to legitimization, the modern state, and nationalist particularism were explored through an examination of levels of legitimizing architectural and urban traditions in four Gulf cities, which were categorised into chronological, representational, and interventional. My work continues to place emphasis on examining the perceived quality and the measured characteristics of the designed environment at both architectural and urban scales. Earlier works included the utilization of structured methods for assessing the learning environment from user perspective in the context of North Carolina, United States, user-centred workplace pre-design research in the context of the state of Minnesota, United States, assessing outdoor spaces of campus environments in Qatar, the examination of users' reactions of Al Azhar Park in Cairo, Egypt, the impact of the spatial qualities of the workplace on architects' job satisfaction in Belfast, Northern Ireland. More recent work focuses on experiential assessment and examining attributes of urban open spaces which involved a spectrum of tools. Additionally, these tools have been validated in the context of Glasgow city centre including the development of a multi-layered investigation of St Enoch Square and characterisation and systematic assessment of urban open spaces in Glasgow city centre. An examination of the perceived and measured quality in architecture is being undertaken utilising the Riverside/Transportation Museum as a case study. An inclusive research approach that demonstrates the impact of various variables is amenable to attract practice and industry. My consulting work engages with practice and industry including different institutions, real- estate development companies, and consulting and governments agencies. Examples of engagements with industry include various on-site technical review assignments for assessing housing projects in El Oued, Algeria, Social housing in Wilad Djallal, Algeria, Mosque and Islamic Cultural Centre, Rome, Italy. Examples also include action planning for the redevelopment of the historic core of the city of Quseir, Egypt, and a decision support scenario for real estate development projects in the city of Jeddah, Saudi Arabia. My research into sustainable tourism or ecotourism and the development of ecolodges is coupled with developing charrette processes for designing ecolodges in the Red Sea region, Egypt. This was based on earlier studies centred on developing guidelines and best practices for ecotourism and ecolodge development. See eco-tourism and the Egyptian context, eco-friendly lodges in Egyptian settings, and requirements for ecolodge design.